Oil on canvas, 41 x 32 cm. Kneeling and with hand on heart, a simple man declares his love for the shy kitchen maid, who stops her chores to listen to his speech. She has a tub of celery on her lap, and on the kitchen table a variety of utensils and an abundance of vegetables can be seen. 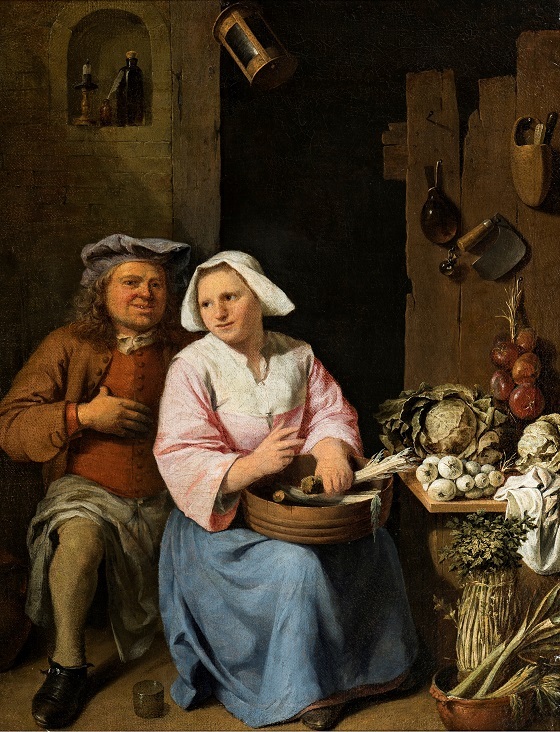 Nicolas Walraven van Haeften also made an earlier sketch of this scene, where the corresponding dialogue reads: “Jean is quite gentle as he loves the kitchen. The expression on Marguérite’s face reveals that she likes it.” The dialogue has a risqué character to it, supported by the knowing look exchanged between them.